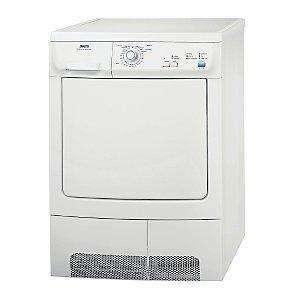 I need to buy a Condenser tumble dryer and want to know if this is a good price? The large-capacity Zanussi ZDC47100W condenser dryer features electronic sensor controls to assess when the laundry inside is dry, and end the cycle automatically. This saves energy and minimises over-drying or creasing of fibres. It has 2 temperature drying settings, and 5 optional programmes easily selected from electronic push button controls. It has two easy-clean fluff filters, and the wide door opening makes it easy to load and unload (door reversible by an engineer at extra cost; see instruction book for details). You can also safely locate this machine in a cupboard. You can expect to save around 15p - 20p per drying load compared to the C rated dryer and so if you use it 200 times a year, you will save £40 each year. JL don't pricematch Dixons as they have no high street stores - only Currys.